Its the Big Day. You deserve the Best! It’s the Big Day. But how’s Mom getting there? Or your bridesmaids? Or for that matter, your fiancé? How about Grandma and Grandpa? What about pictures? That’s a lot of people to organise. Just as important, how’s everybody getting from the ceremony to the reception… and then home safely? Learn about your legal responsibilities and our Safe Ride Home®. Cheers! Okanagan Tours delivers peace-of-mind transportation solutions. We get everyone where they need to be, when they need to be there. 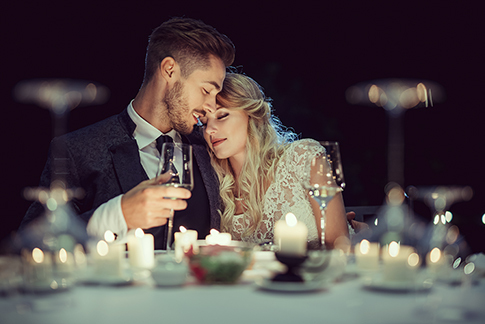 Out-of-town Guests combining your event with a weekend getaway or part of a vacation will appreciate you directing them to our Myra Canyon, Winery, Lake and Local Attraction Tours. 4-hour continuous evening on-demand (or timed) shuttle service is $520* (tax & gratuity included) per coach. Additional hours are available for $130/hour (tax & gratuity included). Rates are based on Kelowna departures. Repositioning fees apply for services outside the immediate Kelowna and West Kelowna area. Other Shuttle services are available from $130/hour (tax & gratuity included). Price based on season and subject to availability. We respect your trust in our ability to serve you with excellence as an integral part of your once-in-a-lifetime experience. As a courtesy to wedding guests, respected industry leaders like Brides® and theknot.com® highly recommend you endorse a trusted tour company to out-of-town guests who have not visited the (Okanagan) area before. Many guests will use the wedding as motivation for a weekend getaway or an all-out vacation. Your endorsement expresses your thoughtfulness and it will make your guests’ visit that much more memorable. *Cheers Okanagan Tours requires being published in the “Things to Do” & “Travel and Transportation” category on your wedding website or in a special communiqué to your guests if you don’t have a wedding website. Remember, Cheers! delivers peace-of-mind wedding transportation solutions. We get everyone where they need to be, when they need to be there. “Had a lovely conversation with our driver Peter for our whole ride home! He was very polite, timely and punctual, even when we were heading home super late at night. He even went out of his way to make a much-needed pit stop. 10/10.” Ian E. Trip Advisor. It is important to note that our Wheelchair Accessible Transportation services consists of providing a qualified driver, transportation and assistance on and off the Coach. We do not have the capacity to provide personal care or assistance while on tours. Please ensure that each individual who requires personal assistance throughout the tour is accompanied by a qualified care aid or personal support person. 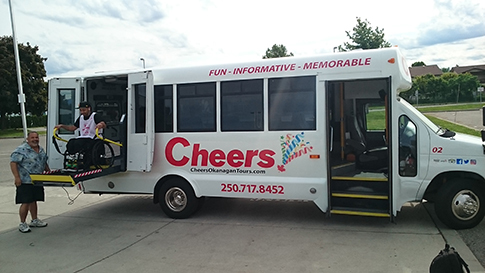 Our 16 and 20 passenger Coaches are licensed and insured to provide accessible charter transportation services within the Province of British Columbia. The comfortable air conditioned Coaches are equipped with a wheelchair lift and 2 sets of tie downs. The Coaches are inspected and maintained regularly in accordance with BC Motor Carrier regulations. Seating on the buses can be configured to accommodate varying passenger loads (up to 22) depending on the number of passengers in wheelchairs.